Yes! I finally did it. I made Thomas Keller's ad hoc chocolate cookies... at high altitude. Baking cookies from scratch has been a battle for me. Granted, I haven't spent too much time trying to perfect a recipe because the last thing I need is to have piles of cookies laying around. 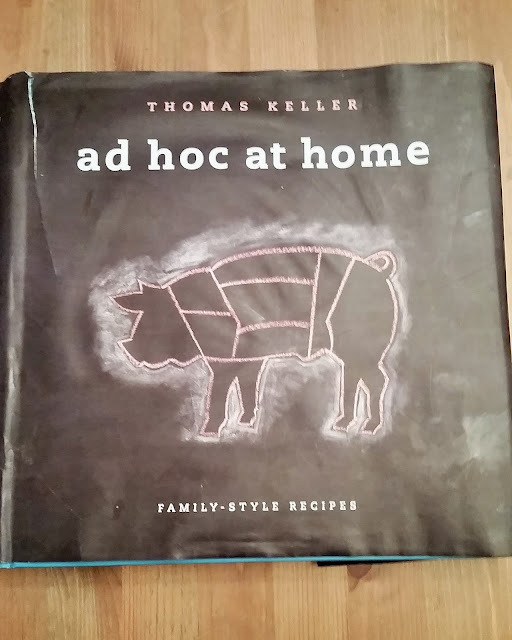 My well-loved copy of Ad Hoc At Home. It's still one of my favorite Christmas gifts to date. If you haven't heard of Thomas Keller, he's a popular chef with fancy and delicious restaurants and bakeries in California. None of which I made it out to, while I lived there. One of the restaurants, you had to make reservations six months ahead of time! In any case, years ago, one of my brothers gifted me ad hoc at home. The chocolate chip cookie recipe from ad hoc make the most delicious cookies. Since we have been living at high altitude, I've made these cookies completely flat, crispy and burnt or big and cakey with no flavor. But this time, at a smidge over 8,000 ft, I made them right! Boom! 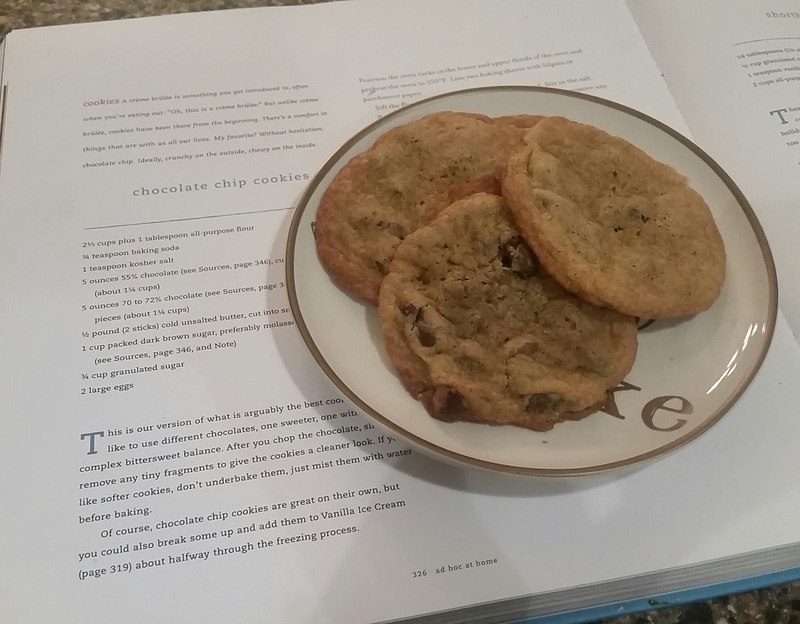 Thomas Keller chocolate chip cookies just right! In a medium bowl, sift flour and mix in baking soda. Add in salt. In mixer, beat half the butter until its smooth. Add in the sugars and the rest of the butter. Mix them in until mixture is light and creamy. Add in the eggs one at a time to the mixture. Make sure the first egg is completely mixed in before adding in the second egg. Add in the dry ingredients to the wet mixture. Then stir in the chocolates. Shape into balls and place onto cookie sheet and put into oven. The cookies will spread quite a bit. My dough balls were about 1.5". On the sheet, there was about 2 inches of space between them. Bake at 365 degrees for 12 to 15 minutes. Remove from oven, place onto cooling rack. 1.5" dough balls yielded about 30 3" cookies, According to the book, well-wrapped dough can be refrigerated for up to 5 days and frozen for up to 2 weeks. As for macros per serving, I didn't have time to calculate that before I ate them. Oh well, life goes on.